Aaron Miller, biochemistry graduate student, wins Crellin Pauling Student Teaching Award at CSUPERB 2017. Photo by Kyle Chesser of Hands On Studio. When the California State University Program for Education and Research in Biotechnology (CSUPERB) hosted its 29th annual CSU Biotechnology Symposium in Santa Clara earlier this year, it featured approximately 690 participants and 290 posters from 22 of the 23 CSU campuses. 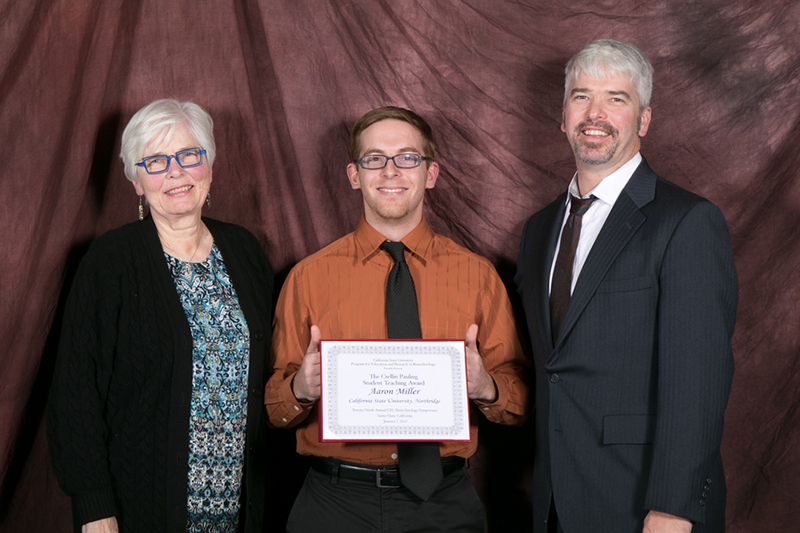 California State University, Northridge’s very own Aaron Miller ’13 (Biochemistry) took home the prestigious Crellin Pauling Student Teaching Award, earning a $2,000 scholarship for his work in CSUN’s General Chemistry labs. Miller said the award honors the memory of the late Crellin Pauling, a researcher and professor at San Francisco State University and a strong advocate of teaching science. Pauling was also the youngest son of Linus Pauling, one of chemistry’s forefathers. Winning the award meant a lot to Miller, particularly because teaching was not something he initially intended to pursue. Miller’s accomplishments did not go unnoticed. He said many universities offered him admission, but he decided to complete his master’s degree at CSUN because of the hands-on experience he knew he would receive there. However, Miller didn’t pick CSUN solely to develop his own project. He said he also chose to remain a Matador because he loves the community and enjoys its diversity.